Almost two months later, and now the latest Saudi novelty comes from the Saudi royal family owned Al Sharq Al Awsat newspaper. 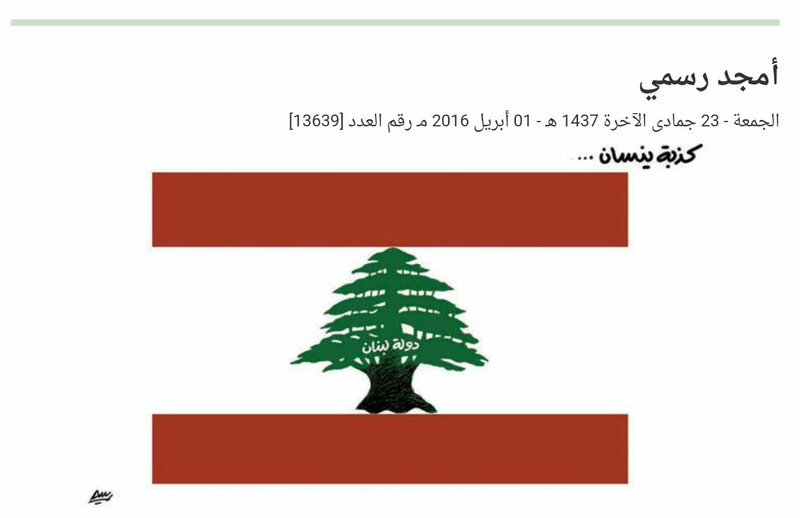 Their caricature on April Fools’ Day showed the Lebanese flag, suggesting that the Republic of Lebanon was, in fact, the biggest lie of them all. Well, it’s no longer April Fools’ and we all know that April Fools’ jokes last for 24 hours only, so technically, the joke is over and we have our country back… why didn’t anybody think about that?! Sarcasm (and logic) aside now, let’s talk about the fact that the Republic of Lebanon got called by the Kingdom of Saudi Arabia (by a newspaper, yes, but which has historically been known as a mouthpiece for the regime) a joke. Again, I could end my post here, with this being yet another joke, but I will continue. Saudi said Lebanon was “overreacting” to the cartoons. Could have Lebanon gotten away with that same argument while protesting Saudi’s freezing of its assistance, presumably because Lebanon’s stances were not “supportive enough” of the kingdom after “everything it had done for Lebanon”? I don’t think so. On the other hand, and as expected, there has been no official reaction from the Lebanese government on what happened. Everyone is probably very scared, as people with no dignity are, of saying anything that may anger the kingdom at the expense of their country…. Money talks, doesn’t it? One of my random thoughts about the incident was that if a Lebanese newspaper (one the kingdom hasn’t bought already) insults Saudi Arabia, it’s considered treason; but if it’s a Saudi paper insulting Lebanon, Saudi’s Lebanese lackeys will say it’s freedom of expression. Funnily enough, it was the Gulf Cooperation Council (GCC) that came out using that same argument against a bunch of ridiculous, attention-seeking youngsters that decide to vandalize Al Sharq Al Awsat’s Beirut offices in reaction to the cartoon. The GCC probably didn’t dare use the freedom of expression argument itself for the caricature, but still used it when the physical properly of those behind it was attacked. What a joke. Back to the caricature, all I want to say is this: Lebanon is not a perfect country, republic nor nation, it never has and until further notice, never will. 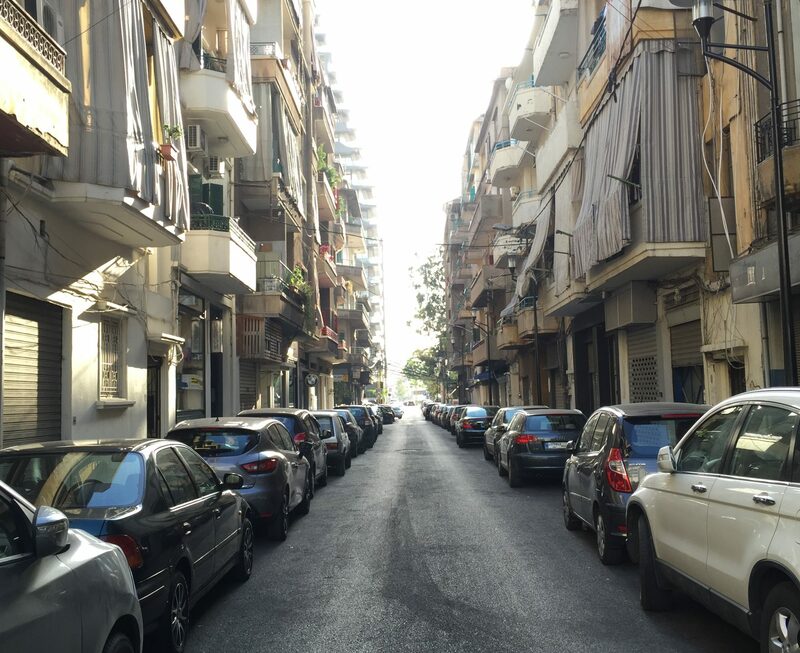 We are a perfect failed state most of the times and the Lebanese will be the first and most enthusiastic supporters and promoters of this reality. We cry and joke about it day everyday. But Lebanon is not a lie and we are not a joke, if only because even after all our own turbulent, unstable and war-ridden history, no matter how much the world gambled on our demise and not matter how much money was thrown into Lebanon to keep us fighting each other and others fighting us (Saudi Arabia being one of them), we are still on the map. Wow, now that’s actually a very good joke. The biggest joke is to be called a joke by a family business that calls itself a country. Called a joke by the mouthpiece of a hypocritical regime that calls on the decadence of the world and preaches its own purity, while it practices that same decadence abroad and forgets everything about purity. Called a joke by a regime that doesn’t allow for its women to drive, its inhabitants to freely practice their beliefs and adopts medieval forms of punishment on its own people for breaking the law. Called a joke by a regime that believes it can buy the voice and loyalty of its people and the world with its petrodollars. Called a joke by a regime that is believed to finance terror, while most of the world keeps silent because of Saudi energy resources and those very same petrodollars they see invested in their governments, banking systems and businesses. Better be an April Fools’ joke for a day…than one of many regimes considered to be the worst of jokes of contemporary history.